Waiting for direct flights from Dublin to China is like waiting for a bus. You wait and wait and wait, and then two come along at once. Cathay Pacific announced last year that they will fly direct from Dublin to Hong Kong from June 2018 onwards. Now comes the announcement that starting the same month, Hainan Airlines will operate direct flights from Dublin to Beijing too. The announcement came during the St. Patrick’s Day trade trip to China by the Tánaiste and Minister for Foreign Affairs, Simon Coveney. He said it will likely dramatically boost the number of Chinese visitors to Ireland, as well as further foster business links between the countries. The direct flights from Dublin to Beijing will operate on Tuesdays and Saturdays. Return direct flights will operate on Thursdays and Sundays. There will also be services on other days, with a short stopover in Edinburgh. Flight time for the direct services will be approximately 11 hours. If you visit Beijing, you’ll find yourself in a sprawling, teeming city, that’s an intriguing mix of past, present, and even future. This was home to emperors for centuries, and at 180 acres, is the largest palace complex in the world. It has over 800 buildings which are said to combine for 9,999 rooms, so you could literally spend days exploring. Highlights include the Gallery of Treasures, and the Imperial Gardens. You can reach it within an hour’s drive of downtown Beijing. Travel two or three hours to another spot instead, and it’ll be far less crowded. Long sections are still suitable for hiking, and it’s amazing the peace you can find within even 15 minutes’ walk from the bus parks. This has stood since 1302 and pays tribute to China’s greatest teacher and philosopher. It also served for many years as the highest seat of learning in the land. Individual areas have names such as the Hall of Great Accomplishment, the Hall of Great Perfection, and the Hall of Supreme Wisdom. Clearly, they still think a lot of him! 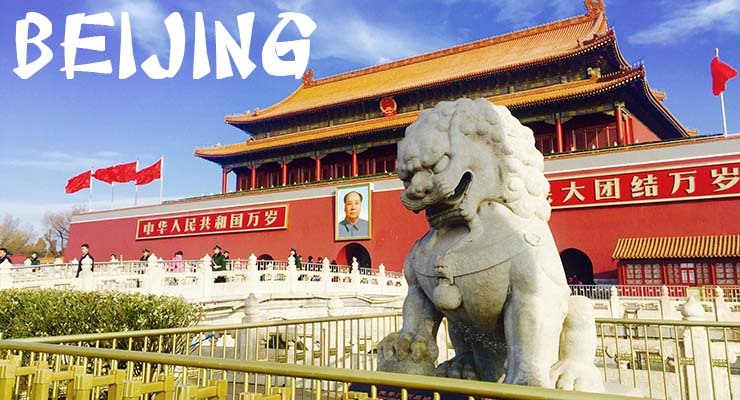 You have several options for visiting the final resting places of emperors, but The Qing Tombs are possibly the best. They stand just an hour’s drive north-east of the city, and nine are open to the public. One tomb alone is said to contain 72 tonnes of intricately carved silver, while another is said to have the three most ornate marble gates in all of China. If you visit central Beijing, you simply won’t be able to miss this, even if you try. As it’s the largest public square in the world, you’ll have to cross it at some stage. There’s not actually much here to see, as it’s basically just a wide open space. Instead, think of its significance in Chinese history. It’s where Mao Zedong announced the founding of the People’s Republic of China in 1948, and it’s where the student protests and student massacre took place in 1989. If you’re making plans to travel to Beijing for business or pleasure, make sure that you and your travelling companion(s) are carrying comprehensive travel insurance for the trip. A policy with Insure My Holiday will entitle you to some of the best levels of cover at some of the best rates around, whether you choose single trip travel insurance for your trip, or annual multi-trip travel insurance, if you’re likely to do more travelling in the coming year too. All are as generous or more generous as you will find with any other travel insurance provider, so it all adds up to even more great reasons to choose Insuremyholiday.ie for all your travel insurance needs.